ERS (European Remote Sensing Satellite) are a family of multi-disciplinary Earth Observation Satellites. The satellite concept is based on the re-utilisation of the SPOT Mk.1 Multi-mission Platform, developed within the French SPOT programme. This platform provides the major services for the satellite and payload operation, in particular attitude and orbit control, power supply, monitoring and control of payload status, telecommunications with the ground segment. AMI - Active Microwave Instrument combining the functions of a Synthetic Aperture Radar (SAR) and a Wind Scatterometer. The SAR operates in image mode for the acquisition of wide-swath, all weather images over the oceans, polar regions, coastal zones and land. In wave mode the SAR produces imagettes (about 5 km × 5 km) at regular intervals for the derivation of the length and direction of ocean waves. The Wind Scatterometer uses three antennae for the generation of sea surface wind speed and direction. RA - Radar Altimeter provides accurate measurements of sea surface elevation, significant wave heights, various ice parameters and an estimate of sea surface wind speed. ATSR - Along Track Scanning Radiometer combining an infra-red radiometer and a microwave sounder for the measurement of sea surface temperature, cloud top temperature, cloud cover and atmospheric water vapour content. PRARE - Precise Range and Range-rate Equipment is included for the accurate determination of the satellite's position and orbit characteristics, and for precise position determination (geodetic fixing). LRR - Laser Retro-reflectors allow measurement of the satellite's position and orbit via the use of ground-based laser ranging stations. MS - microwave sounder: supplies data on atmospheric humidity. ERS-2 is similar to ERS-1 with very similar instruments, only the GOME instrument has been added. GOME - global ozone monitoring experiment, an absorption spectrometer which measures the presence of ozone, trace gases and aerosols in the stratosphere and troposphere. The satellites were orbiting in the same orbital plane, with all instruments simultaneously operating. 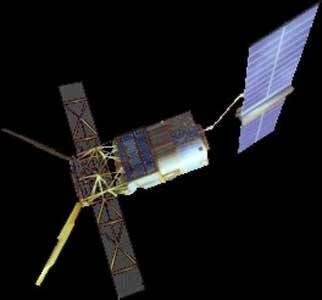 Successor to the ERS satellites was Envisat 1.